Stuck in your weight loss plateau? Feel like you are gaining pounds rather than dropping them? It is time to reconsider your entire diet and make some tweaks. Does your eating plan consist of lean protein, fiber, vitamins, minerals, and antioxidants? To lose weight and keep it off, your diet should never lack nutrients. If you are looking to shed more pounds, skip the meat and incorporate these vegan foods into your meal plan. Why plant-based foods? Despite all the popular beliefs, vegan foods are plentiful in nutrients. Plus, they boast excellent cleaning and healing properties. Being highly alkaline, vegan foods fight inflammation that many animal-based foods cause. Ever wondered why vegetarians are so slim and healthy? They enjoy these eight foods to the fullest. If you have not been eating meat for a while – no matter whether for a few weeks or years – you have already realized mushrooms are an absolute best replacement for meat. They are low in calories, yet are quite filling. Most mushrooms are chock full of fiber, vitamins, and antioxidants, making them a must-have ingredient in any diet. No diet or healthy food list is complete without spinach. Spinach is overflowing with vitamins A, B6, C, and higher in fiber and protein than kale. If you do a little digging, you will find out that spinach is fortified with health-promoting phytonutrients, including zeaxanthin, lutein, and beta-carotene. Use spinach in juices, smoothies, salads, soups, stews, stir-fries, and other meals. The richest source of protein, spirulina is also plentiful in vitamins A and B12, omega 3s, and iron. When added to smoothies and green drinks, spirulina boosts your energy levels instantly. It helps control cravings and promotes weight loss. If you are going to take a supplement, make sure you consult your doctor first. Apart from having powerful weight loss benefits, berries are good for your heart health. Plus, they reduce inflammation, and boost your immunity and energy, increasing your workout time. Berries are among the best sources of antioxidants, and most of them are glycemic friendly. Oatmeal is one of the most favorite foods of every vegetarian girl. We add oats to literally everything – from yogurt, smoothies, and soups, to sweet or savory oatmeal and desserts. Oats are digested slowly, leaving us feeling fuller longer. 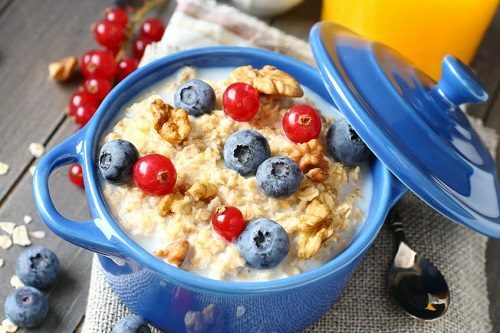 Oats are loaded with fiber, potassium, magnesium, iron, vitamin B6, calcium, and protein – all the essential nutrients that help your body burn calories. I’m not a big lover of lentils, but if you are, perfect! Lentils are one of the best vegan foods that can help you shed those pounds faster without starvation. They are hearty, protein-packed, fiber rich, and easy to cook. A cup of lentils provides your body with all essential amino acids, which aids in weight loss. You can use them in soups, stews, salads, or as a side dish. The richest source of natural plant-based omega 3 fatty acids, flax seeds are also high in fiber and low in carbs. Eating these miraculous seeds regularly helps to fight bloating, prevent inflammation, keep you regular, improve hormone function, and aids in weight loss. One of the easiest legumes to digest, green peas are incredibly nutritious and versatile. They are a wonderful source of amino acids and B vitamins, which play a significant role in boosting metabolism thus burning more calories. Green peas are also fortified with vitamins A and C, protein, fiber, potassium, iron, magnesium, and more. Surely, these are not the only vegan foods that can help you shed pounds. I just want you to understand that you can live without meat and vegan foods are not rabbit foods. They are tasty, filling, and super healthy. What are your favorite vegan foods?